Every summer, the Metropolitan Museum of Art mounts a sculpture exhibit on its roof. Aside from the sweeping views of Central Park and the mansions along 5th Avenue, it’s a chance to see some big-idea installations. I don’t know who curates these things but it’s been one home run after another. Last year’s Maelstrom by Roxy Paine was a hoot. 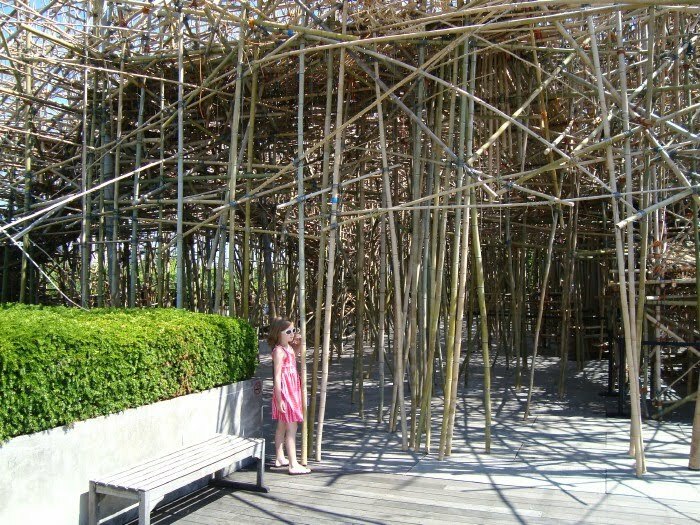 This year, Doug + Mike Starn have mounted Big Bambú. 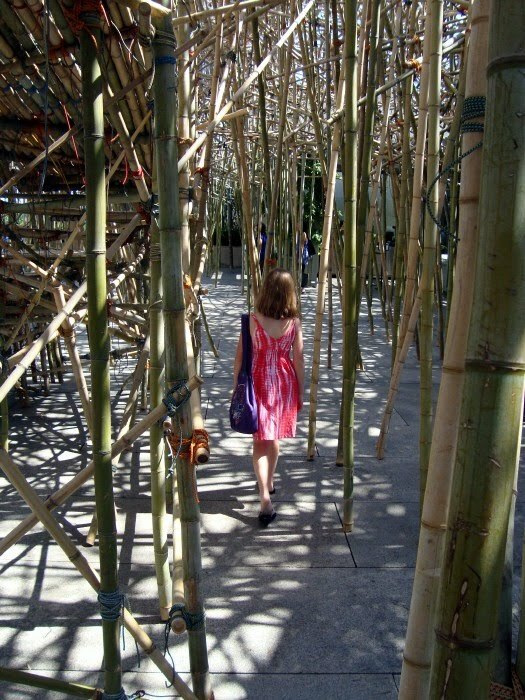 The project consists of fresh cut bamboo poles lashed together with nylon rope. The construction of the sculpture is ongoing and will continue throughout the summer. It closes October 31st, which is pretty late in the year for this sort of thing. The cool interactive aspect of this project is that the sculpture contains a series of steps and ramps that allow you to actually walk up into it. During the day, workers continue to assemble the sculpture around you. 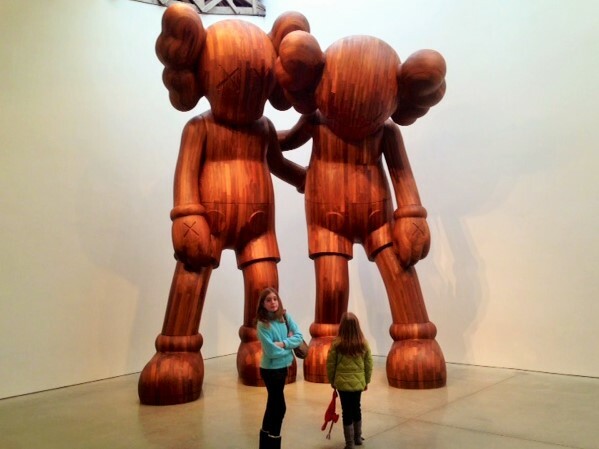 Unfortunately, you have to be at least 10 years old in order to walk into the sculpture, so when I was with 8-Year Old Daughter, I couldn’t go up. But the exhibit is there for a while so I’ll make my way up at some point and post photos. At its completion, it’ll be 50 feet high! You have to get a (free) timed ticket in order to go in the sculpture and my understanding is that you’re better off going on a Wednesday or Thursday because on the weekends, tickets for the entire day are taken fairly early in the morning. For me, the exhibit doesn’t have the “wow” factor that Maelstrom did, but it’s worth a visit simply because of the grandeur. 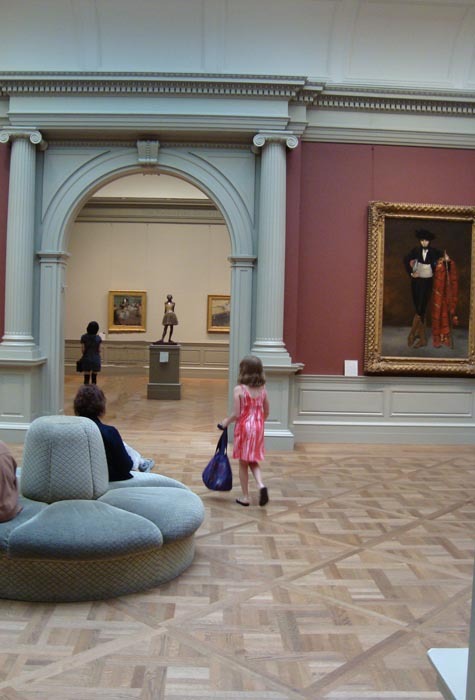 What’s a trip to the Met without visiting some old friends? Take a look at this photo and compare it to the one in my banner. She grows! 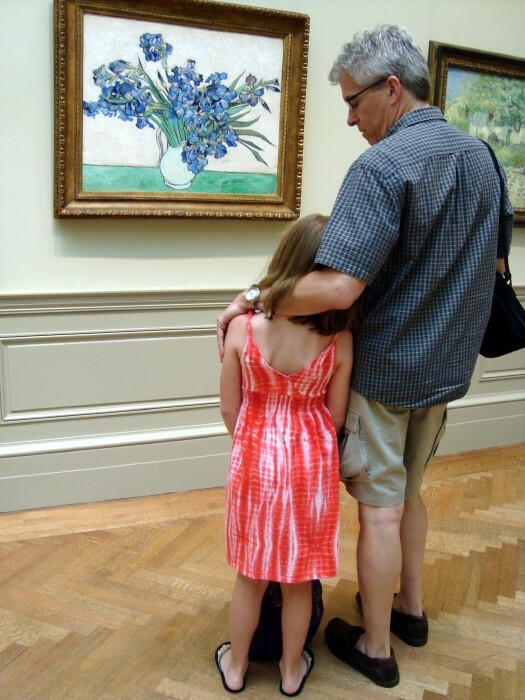 The background on van Gogh’s irises was originally painted a pale rose, but over the years the pigment has faded out of the paint and now it’s a chalky white. The original color can still be seen along some of the edges if you get close enough. 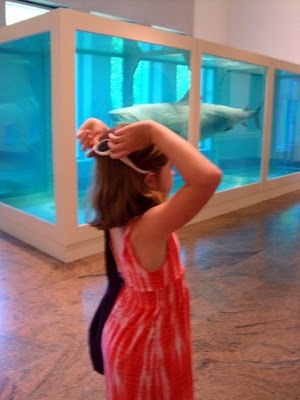 This shot of Damien Hirst’s shark in formaldehyde was taken surreptitiously. You can take photos of pretty much anything you want in the Met as long as you don’t use a flash. But a security guard is always on hand to prevent people from taking pics of this piece. I wonder why? I quickly snapped this while the guard was yelling at someone for taking a picture. Yes, the shark is (was) real. Daughter made a special request to visit Degas’s little dancer. She walks around the Met like she owns the joint.